Are you one of the millions of people around the world suffering from back pain? Do you spend a lot of money on doctors, chiropractors, physical therapists, pain specialists, X-rays, and MRIs? Have you tried pain medications, ergonomic chairs, pillows, beds, braces and in some cases, even surgery, but still can’t find relief? Would you believe that all you need to cure your back pain is a tennis ball? It’s true. 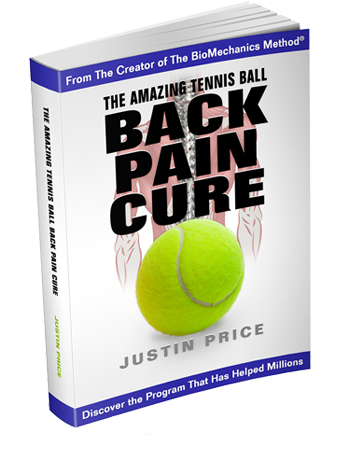 The Amazing Tennis Ball Back Pain Cure, available in print and e-book format, is the ultimate guide to helping you overcome back pain. This easy-to-follow book from one of the world’s top back pain experts provides you with all the tips, tricks, and techniques you need to get rid of your pain for good. Buy The Amazing Tennis Ball Back Pain Cure today. “The tennis ball techniques I learned from Justin were life changing. He showed me how to loosen up my spine, lower back, and hip muscles which gave me freedom to move on the tennis court like I wanted. As a Physical Therapist, I teach my patients the same techniques in this book to enable them to achieve their goals”. “Approaching almost seventy years of age I had back, elbow and shoulder pain. These tennis ball techniques helped me alleviate these pains and enabled me to move like I did thirty years ago." “These tennis ball techniques help you develop intimate knowledge of how your own body works and heals as you do it to yourself, as opposed to more complicated therapies that leave you in ignorance as they are done to you”. “I have suffered from low back pain due to excessive lumbar lordosis. The tennis ball on the lower back technique is very easy to apply and by far the most effective exercise for relieving my pain in my lower back”. "When I become aware of these simple and effective tennis ball techniques I wanted to share the good news. These self-massage techniques have alleviated my shoulder discomfort, released tension in my spine, and put a smile on my face." • Help joints function correctly and without pain. The Amazing Tennis Ball Back Pain Cure will show you how to get your body back into better working order to eliminate your aches and pains. The Amazing Tennis Ball Back Pain Cure can also provide relief for pain associated with chronic conditions such as arthritis, fibromyalgia, neuropathy, irritable bowel syndrome, asthma, and chronic fatigue. Will It Help Other Aches And Pains? You may be thinking that the possibility of eliminating your pain once and for all with such an inexpensive remedy is just too good to be true. Ordinarily, you’d be right. What makes The Amazing Tennis Ball Back Pain Cure different is that was developed by one of the world’s most sought-after pain relief experts. Justin Price, a biomechanics specialist and foremost authority in corrective exercise, has spent over 20 years helping people overcome chronic aches and pains using a simple tennis ball. In addition to his own work with clients, his remarkable tennis ball techniques are used worldwide by health and fitness professionals trained in his pain-relieving educational program called The BioMechanics Method® (www.thebmm.com). As a result, Justin’s methods are used by millions of people in over 25 countries to successfully eliminate muscle, joint, and back pain.